When NASA’s Mercury Surface, Space Environment, Geochemistry, and Ranging spacecraft made its first flyby of Mercury in 2008, astronomers spotted strange deposits: blankets of material ranging from tens to thousands of kilometers wide whose color led researchers to informally dub them “red spots.” To date, scientists have cataloged more than 150 of these objects—and now, the International Astronomical Union has given them formal names. All of the new monikers contain “facula,” which means “bright spot,” reports today's Science, because they are brighter than the background terrain, as well as the word “snake” in one of Earth’s various languages. They take their serpentine name not from their appearance, but because the Roman god Mercury often appears with snakes on his staff. 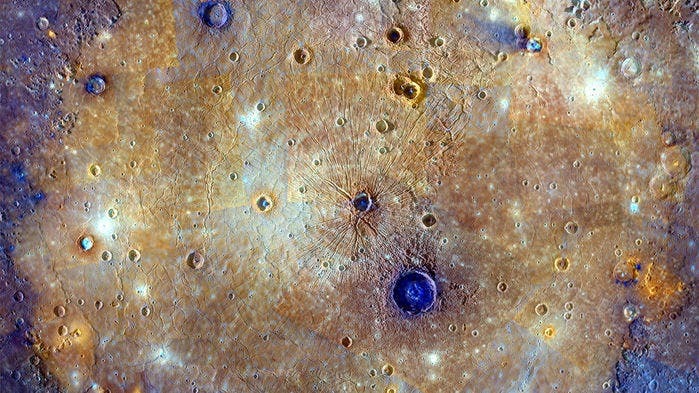 Spread across the planet, the faculae have been linked to billions of years of explosive volcanism in Mercury’s past. Back then, rising, volatile-rich magma caused a more violent explosion than molten rock alone would have experienced, suggesting that Mercury’s interior wasn’t as dry as once thought. Four of the seven newly named features lie in the Caloris basin, shown above, where faculae take names from African languages of the Somalian, Igbo (of southeastern Nigeria), Arabic, and Afrikaans. The remaining features—announced Friday—contain the Irish, Welsh, and Basque words for snakes.